So thankful for the many who helped me through praying and giving. There are some real challenges but I know God is able. I do believe this trip has the potential to change so many lives as the pastors pass this on to others who will pass it on. I believe the leadership will be tweaked a bit and that will make a big difference. I mentioned Allegri- a man who is not Zambian and has been in a Refugee camp a few times. His humility was great but he is also very sharp. Since we left he was beaten badly and has returned with his wife to the refugee camp. He has also been passing on 2 Timothy and desires to be a missionary. I am so thankful for meeting him and His life is a real challenge to me. It's interesting to realize that I went to train Zambians and God is using that to reach people in a refugee camp. I preach Sunday morning in a different church than we've been meeting in. One of the pathways students this week invited me to preach at his church. Peter excelled at the training and was a real blessing. I'm looking forward to serving at his church. We fly out at 930 tonight. We are on the same flight to Dubai but then we part ways. We are hoping to sit by each other on the way out but haven't been able to make that happen from home. I have a 7 hour layover in Boston. I have a 13.5 hour flight to Boston. My nose is still plugged up. I get to Minneapolis at 11pm or so. Pray for my preaching and traveling. But pray especially for the training here... There are many challenges and yet we can see how God could transform countless lives if these Pastors will stick to and pass on Pathways. Yesterday was a good day. Still have challenges. Found that most people had passed on the training and a few of those they'd passed it on to were passing it on. The presentations went alright - the first one was better - likely they put more time into it. Today is a big day - last presentation - and they need to come prepared to get the most learning. We also have to enourage them and send them out to continue it. Leaders need to really lead. Bryan is preaching the closing demo sermon. We need great attendance today. We also need to get more and more ownership of the training. So rather than bullet points - the above are my prayer requests. Thanks for praying. God's hand is evident. Also - Bryan and I both preach tomorrow - somewhere. I don't even know where. Kind of a diary of our time in Zambia so far. This is kind of long... but some may find it helpful or interesting. Flying went well. When I got to Boston my nose started feeling stuffed up and I felt a little cold and got a headache. I’ve been battling some sort of stuffy nose since. The flight to Dubai was long. I sat by a nice man from India - was hoping to talk to him more but he didn’t seem interested - though he was very polite and kind. It was 12.5 hours. In Dubai I was originally hoping to meet Bryan at Burger King in the terminal we arrived in. However, when I got to Minneapolis they only checked my baggage through to Dubai - because I had more than 12 hours there. However, Bryan’s luggage went all the way through. I had texted him in Boston that we could meet in baggage instead of at Burger King.. 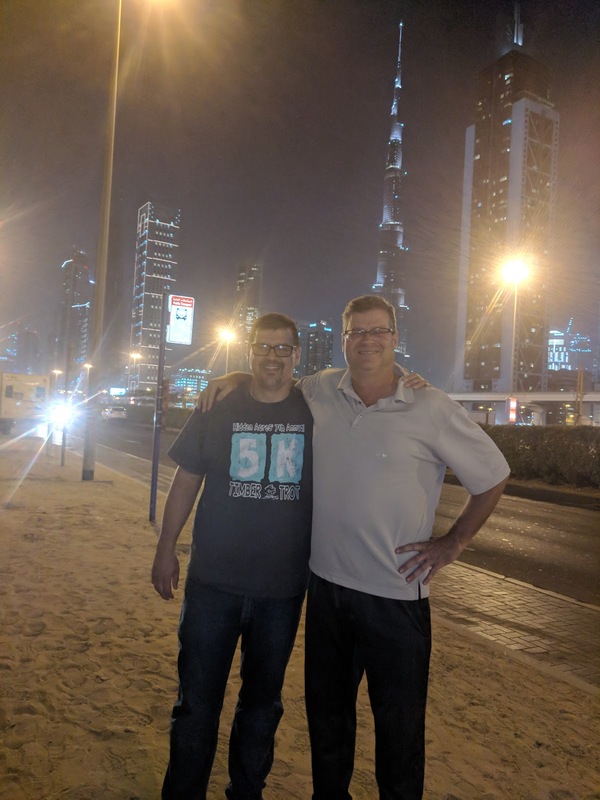 When I landed in Dubia my phone worked (I get free texts and Data in Dubia and Zambia, but phone is 25 cents per minute - T-mobile is great). I had a text to meet him in baggage. So after walking for a long ways, I found him there. It was great. We found a taxi that took credit cards and got to our hotel (it also had free wifi in it). Our hotel was very nice. We walked down the street looking around looking for a place to eat. Ended up eating at a burger / chicken place close to the hotel. It was very cheap and very good. We hit it off well… really enjoy each other and laugh a lot and agree - just easy to talk to. We are working well together! Got to the airport and took a few minutes to figure out where to go. But was through quickly so we had quite a few hours to kill there - started some work on 2 Timothy material and planning. Sat by each other on the plane on the way to Zambia. It was smooth getting through Zambia customs and immigration. We got out and looked for our ride (someone holding a piece of paper with our names on it). No one was there. So we waited 5 minutes and our ride showed up. 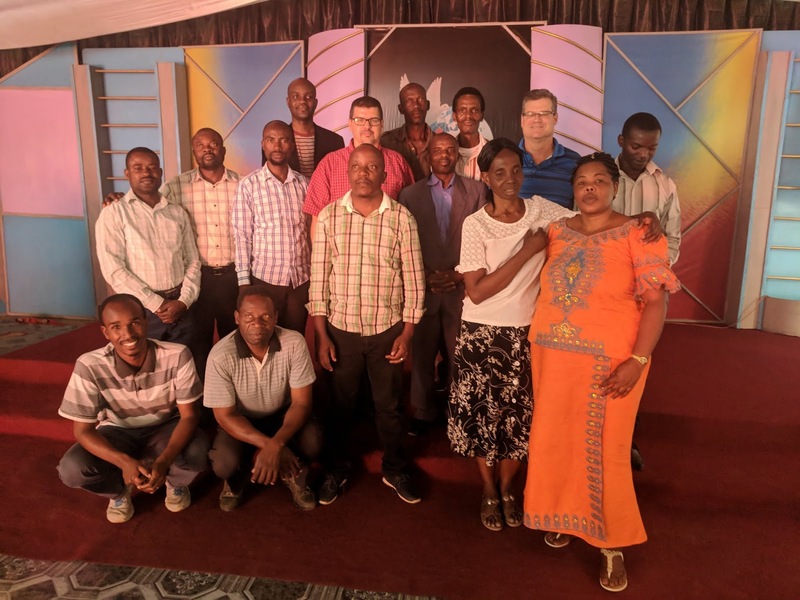 We were able to meet Pastor Chuma and he is a great host. We got back to the house where he fed us (fufu, fish, rice, greens, beans). Then he invited us to their midweek service and off we went. We ended up sitting towards the front on the right side on a couch (the only such seat in the church). The music was done by two people (the full band comes Sunday) - a keyboard and drummer - the drums need lots of love - they are in rough shape. The keyboard player was amazing. Lots of singing… Lots of praying. Lots of praying where everyone was praying at once… and just when I thought we were done, we would be encouraged to pray more. I do believe corporate prayer should be a hallmark of the gathering of the Body. He preached from the passage in Genesis where Joseph found favor because God was with him - and yet Joseph ends up in prison. After the service we came back to his house where he fed us again. His wife was working until 10 - she is a doctor. He has one daughter - Jemima - who is 19 months. There are three young ladis that live with him - Agnes is in college studying nursing. Anna might be starting college in nursing. Gloria is in 10th grade and wants to be a Doctor. These three are ladies in need who has gotten to know and so has taken them in. He also has a maid that is like family - Thelma - she is in high school. Pastor Chuma is very funny and keeps us laughing. The family are amazing hosts. Bryan and I share a room - with a bed and a mattress on the floor (I have a funny feeling that we are in one of the girls’ rooms and that the mattress on the floor is one of their beds. We also have a bathroom to use - that no one else seems to be using this week. To bathe, we can either use cold water in the tub (no shower head) or they boil water on the stove to add to a bucket in the tub. I’ve done it both ways. Thursday morning we got up shortly before 7 and got ready. We ate breakfast - which they offered many things - we had bread with peanut butter and scrambled eggs. Then off to training. We are meeting in the sanctuary of his church - which is a frame of a building with a metal roof and the sides are all canvas or some such material. We have a big board with a large flip pad of paper. We met with the coordinators first. There are always many challenges to doing Pathways. A very large one is money. With Pathways we don’t want to pay for the training because it impedes multiplication. If we pay for the training this time, who will pay next time? We talkd about this a bunch and we did have permission from Eric Belz (Pathways Africa Director) to give some money to help with costs. There were a few older men who walked 2 hours to get there because they couldn’t afford the 50 cents to a dollar 50 to take a taxi or bus. When the choice comes to feeding your family or going to training, most will choose the food. This was discussed in length. In theory we start at 9 but that never happens. However, by 9:30 we were off and going, though not with 100 percent attendance. We introduced ourselves, got to know them, and got started. We found out right away that most had passed on the training, but only one had done the home work. They are supposed to study 3 passages in 2 Timothy and prepare a 3 minute presentation. This is really at the core of our training - and if you don’t prepare this well, you won’t learn nearly as much. There was supposed to be a presentation that day - but we had to rearrange our schedule and plan 2 for the following day. Overall the training went well. Much was learned. We were encouraged. One negative is that 2 of the coordinators in charge are not able to participate much at all. This is really too bad - for a variety of reasons. Another challenge was that a few who planned to make it couldn't make it - so the sent someone in their place - but this person in their place wasn’t up to speed. We also had one person whose child got sick that day and had to go to the hospital - and so they left. That night we got done a little bit early (more time for them to prepare) and we got home. I went out to walk around town (very safe in Zambie) and Bryan took a nap. It’s English speaking so that made making friends easy. 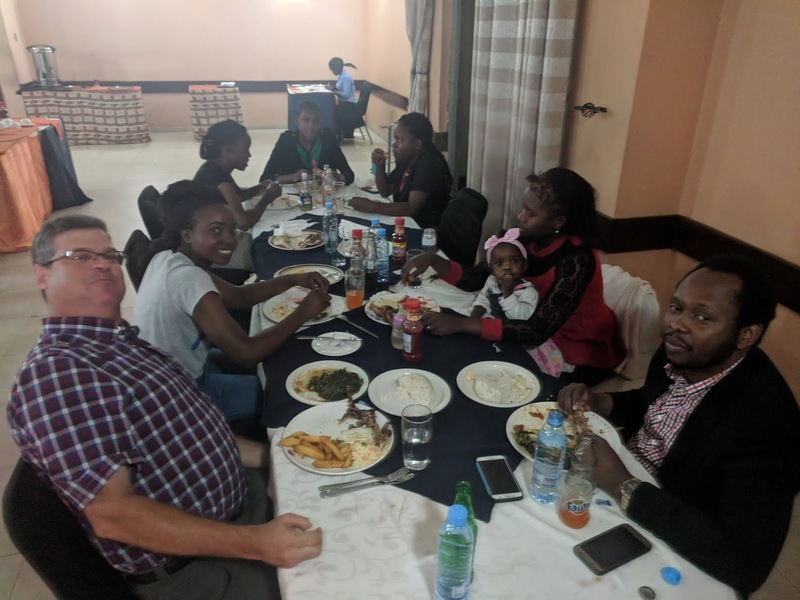 We ate supper with both Pastor David and his wife. I interacted as much as possible with his kids. Bryan gave presents the first night and I gave presents the second night. Friday morning in Zambia - day 2 of training. Again - people trickled in but we got going at a reasonable time. We had our first presentations which went well overall. They were very hesitant to volunteer. For our second set of presentations that day, it was clear most were not very ready - but we finally got people up to do it. The second presentations weren’t quite as good - but they were all aiming the right way. Bryan is doing a great job in every way - he is teaching well and adjusting to the culture and food really well. He is very supportive and doing great at making friends with everyone he meets. It’s a blast being with him. During lunch time he and I did go out a little bit and walk in the streets. We also got money changed so I could have Zambian money to buy things with. We had an hour break af the end of the day and we came home. Bryan slept and I just relaxed and interacted with the family. I finally got Jemima to let me hold her so that was a big win. 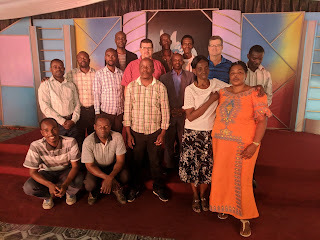 We had been asked if one of us would preach at the Friday night service - a healing and deliverance service… which i found out they did that stuff after the service or as it closed. So Bryan told me to preach. I had to end at a specific time and had an interpreter. It actually worked well and I ended at the right time. I preached from my favorite verses - Romans 12:1-2. I enjoyed it as I always do. We had asked the family if we could take them out for supper and they said Yes - Dr. Esther loves Tbone. 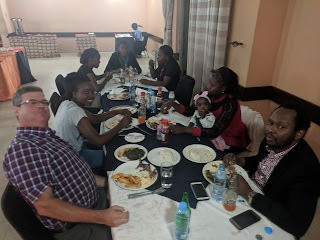 So we went after the service with everyone in the family, including the maid, to a restaurant in a hotel. Everyone had a meal that was a full plate - some sort of meat, some sort of starch, and some sort of salad. Most people had 2 bottles of pop or water. We got extra fries and a few other extra things. And the total bill was $55. I was quite impressed. Then back home to bed. While Zambia cools off well at night, our rooms, with the door shut, do not. I have felt a bit under the weather since I left on Monday. Stuffy nose, headaches, a little achy, some extra sweating… so I’ve been waking up between 3:30 and 5 and not being able to sleep much more. God provides and i haven’t felt tired during the day. I’m not complaining either. What Pathways is doing is amazing. We are seeing men and women learn so much about studying the Bible and teaching it. It is being passed on… Nearly everyone in our group has passed it on to some people with plans to continue. And many who they have passed it on to are continuing to pass it on. Today is our last day of training. Yesterday was our first day of training. It went well overall. We had some challenges. The biggest change we had was due to the fact that only one student had done their homework. I think it's a bit of a new idea for them. It's vital they do it. We were able to rearrange the schedule and get out a few minutes early - to give them more time to prepare for today. I didn't sleep well last night, but that's ok. Our hosts are wonderful. - That the students do their homework and do it well. - that the money challenges are met - and we can help people really brainstorm how to overcome those challenges. Part of that is full buy in. - That everyone shows up. - My voice / throat - I ended up teaching more than expected yesterday due to rearranging the schedule. - I preach tonight at the healing / deliverance service. Did I mention that the man hosting us (he isn't in charge of it all) is quite Pentecostal. Thanks for praying. We are seeing God's hand at work - through us and definitely in our own hearts. We have met some amazing people. (our host family has 3 girls that live in their house that they take care of - but they aren't their daughters. One of the leaders has 18 kids that aren't his own living in his house. We are here. We already went to a church service tonight. 2 hours. More exuberance than you can imagine. We have been talking about the major challenges of doing pathways training and how to overcome them. - people to show up tomorrow .. And to show up with homework done. Bryan and I easily found each other and got safely to our hotel . We found a cheap but tasty place to eat close by. Got some good sleep... I got 5 hours straight but now I'm awake and can't get back to sleep. Have to be up in 90 minutes anyway. I should be sleepy tonight when we get to Zambia. Bryan and I have seats together on this next flight. I have felt a little sick since arriving in Boston... Stuffy nose... Headache... A little achy. Some top prayer requests for today. - that I get back to feeling well. I fly out this afternoon. 13 hours. A new record for me - not one I ever wanted to make. My family is sad - especially certain kids of mine. I know God is in control but I'm sad to see them sad. I'm more nervous than normal - maybe in part because I am the one that has traveled before. - Peace for my family. Maybe that's too much to remember - but there it is. - that these Pastors would grasp the truth of God's Word... And see it. Lots of health and wealth all over Africa.